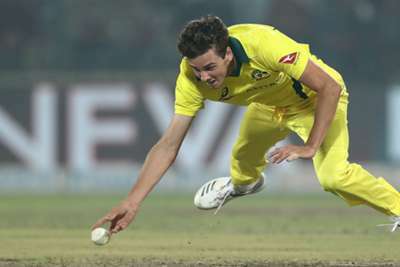 Jhye Richardson will miss the remainder of Australia's one-day international series against Pakistan after suffering a dislocated right shoulder. The paceman landed awkwardly while fielding in the second match of the series in Sharjah, which the tourists won by eight wickets to take a 2-0 lead on Sunday. Richardson, who claimed figures of 2-16 from five overs before being helped off in pain, will fly home to discover the extent of the damage done just two months before the Cricket World Cup begins. Australia captain Aaron Finch said: "He's in good spirits. His shoulder popped out a little bit. Unfortunate for the youngster. "He'll get home, have some scans and assess the damage." Finch made an ODI-best 153 not out – his second successive century – to steer Australia to their target of 285 with 13 balls to spare after putting on 209 for the first wicket with Usman Khawaja (88). Pakistan announced they will rest Faheem Ashraf for the remainder of the five-match series to ensure he is fresh for the World Cup.